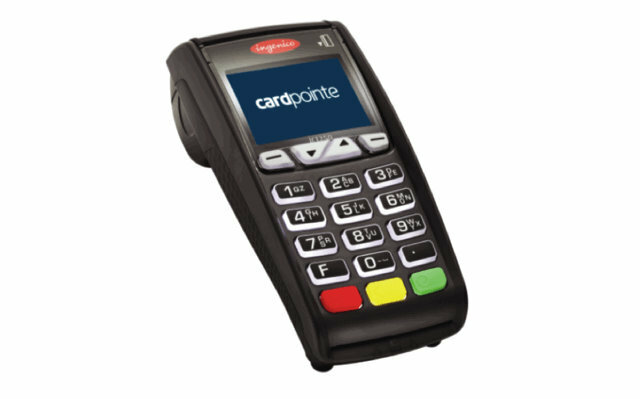 The CardPointe Terminal is CardConnect's P2PE, plug-and-play device that features PCI-certified point-to-point encryption and patented tokenization. The CardPointe Terminal is the only way to truly protect in-store transactions; all sensitive data is instantly encrypted upon swipe or dip, ensuring that sensitive data never touches a merchant's systems. Seamless integration with CardPointe, providing you the power to manage processed payments and view full transaction lifecycle reports in real-time from your desktop or mobile device. Acceptance of payment cards with both magnetic strips and EMV chips. Tip adjust and server ID features with the Restaurant Application, perfect for restaurants, delis, spas and more. P2PE security for every transaction. During a transaction, the CardPointe Terminal transmits a single-use tokenized code to validate the card and its cardholder. This code changes with every transaction, and once it has been used it is no longer valid, thereby preventing counterfeiting and skimming. Interchange optimization automates lower rates for eligible Level 2 and 3 transactions. The CardPointe Terminal has a direct integration with CardPointe. This means that all terminal transactions appear in CardPointe in real-time, allowing you to create customer profiles from those payments, or issue voids and refunds - all without using or being near the terminal. To order the CardPointe Terminal, visit the CardPointe Shop. You can also order the CardPointe Terminal within CardPointe by accessing the "My Account" screen. Note: Use of the CardPointe Terminal requires a merchant account with CardConnect. If you already have the CardPointe Terminal and would like it to be updated with the Restaurant Application, we can complete the update remotely so that you don’t have to worry about getting new equipment or sending anything back. For the update, just reach out to your CardConnect representative or call our CardPointe Support team directly at 877.828.0720 > option 1 > option 1. The CardPointe Shop, is an online store where merchants and agents can purchase devices and accessories. Once items are selected, you may choose from two purchase options - credit card and bill to account. The CardPointe Terminal comes standard with a variety of optional features. The table below defines the available configuration options and their default, out-of-box settings. Note: Access the Settings menu on the terminal to change the Auto Batch Close time. For all other configuration changes, please contact support.